Supporters of newly elected President Carlos Alvarado Quesada cheer after polls closed during the runoff, San Jose, Costa Rica, April 1, 2018 (AP photo by Arnulfo Franco). On April 1, Costa Ricans returned to the polls to elect a new president in a runoff that polling suggested would be one of the closest races in their country’s history. 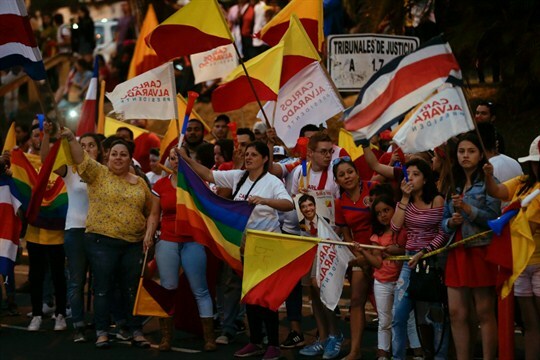 Numerous analysts described the election as a battle between progressive and conservative values, as evangelicals are becoming more prominent politically in Costa Rica. In the end, Carlos Alvarado Quesada, a novelist and former labor minister from the center-left Citizens’ Action Party, defied the pre-election predictions to soundly defeat Fabricio Alvarado Munoz, an evangelical singer and pastor, by more than 20 points.